So, as I was cleaning pureed corn off of the counter, microwave, and coffee pot today (my fault for using a bowl that was too shallow), I started thinking about life and where it has taken me in the past few months. I imagined a lot of adventures when I was a child about where I would go in life, and all of the exciting things I would do. What I have been living the past few months is none of what I ever imagined, but somehow it is better. I have never laughed so much in my whole life. Layla is hilarious and doesn't even know it. A couple of weeks ago I was cleaning out my closet. There were hangers and clothes all over my room and no safe place for a crawling and very nosey baby. I spotted an empy laundry basket and there was my answer. I put her in the basket with some toys, and she sat there and played for over an hour, never trying to escape. She thought she was hot stuff in her pretty blue basket. A few days later, we were in the kitchen. Layla loves to find things in the floor - threads from my bedroom rug, tiny invisible bread crumbs, etc. - and attempt to eat them. She was playing beside her swing, and I was making lunch. I picked her up to put her in her high chair. She was chewing on something and did not want to let it go. I opened her mouth, and to my surprise, she was chewing on a piece of pea gravel. Not what I expected. Apparently one of us tracked it in from the back yard, and she thought it was a snack. Keep in mind, I vacuum and sweep 3 to 4 times a week, so I was shocked to find this. It was too big for her to swallow, but I felt like the most terrible mother - both for not spotting the rock before she did and for cracking up when I found a piece of pea gravel in my child's mouth. Last weekend, Layla woke up on Saturday morning with her usual full diaper. I laid her on the changing table and opened it up. When I opened it, it was the usual shade of sweet potato orange, but there was something white right in the middle. When I looked closer, holding my nose, I realized what it was. All of us have done this, cut a tag off a new item of clothing, and pop! the little plastic end that attaches it to the clothes, disappears into the rug never to be found again. Well apparently my magical Dyson missed this one, but my little blue-eyed vacuum found it. She ate it, and it came out the other end! I was shocked. Why does she eat everything? And how do I miss it. I never take my eyes off of her. She is a sneaky little thing, that's for sure. And today, we were again in the kitchen. You would think I had learned my lesson by now, but I keep a bucket beside my pantry with a ton of snacks in it, such as 100 calorie packs, granola bars, etc. 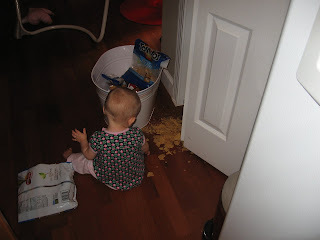 We had an occasion last week where we ate tortilla chips and there was a partial bag of those in this bucket. I did not realize that I had failed to put a clip on the bag to hold it closed. Layla found the bag and started playing with it. She loves the crunchy sound the bags make. 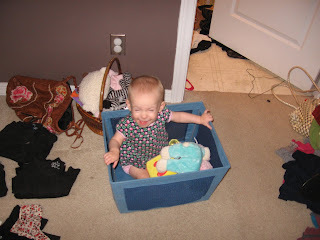 She was laughing and playing, and I reached into a cabinet to get a bowl. When I stood up and put the bowl on the counter, I looked over, and hundreds of tortilla chip crumbs were scattered on my kitchen floor. A very shocked little baby looked up at me with those big blue eyes and just smiled. And, of course, she chose not to eat these. She will eat pea gravel and plastic tags, but she won't eat tortilla chips. I don't get it. But what I do get is that through all of this, I have learned to laugh and not panic. I have also learned not to be angry at myself when these little things happen. I have learned that no mommy is perfect. We all make mistakes, and at the end of the day, that sweet little baby has no idea that her mommy is not perfect.